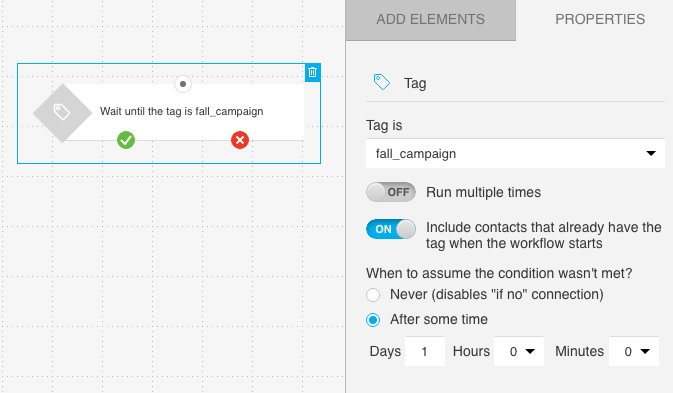 The If tag condition allows you to trigger actions for contacts who receive a specific tag while your workflow is running. You can use this element at the beginning of the workflow or at any moment when you need to make a decision based on tagging. The element has an “if yes” (green) and “if no” (red) connector. If your contacts get the new tag, they are affected by the action you’ve connected to the “if yes” connector. Contacts who don’t have that particular tag move down the path to the action you linked to the “if no” connector. Note: When you use If tag as a start element, link the next element only to the “if yes” connector. 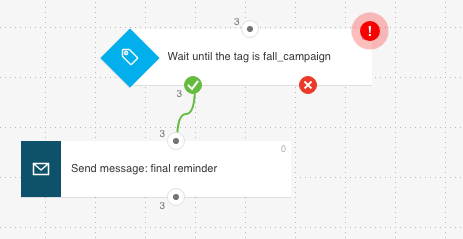 Only the contacts who have the new tag can “enter” this element at the beginning of a workflow, so the “if no” connector simply can’t trigger any action. Does the condition work for contacts who are tagged before my workflow starts running? 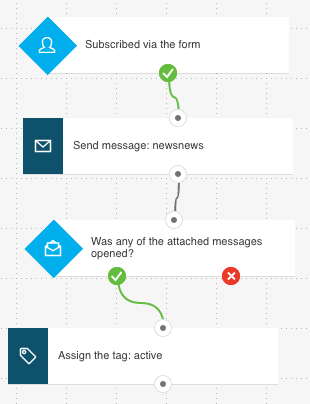 By default, the condition triggers a workflow only for the contacts who are tagged after the workflow starts running. 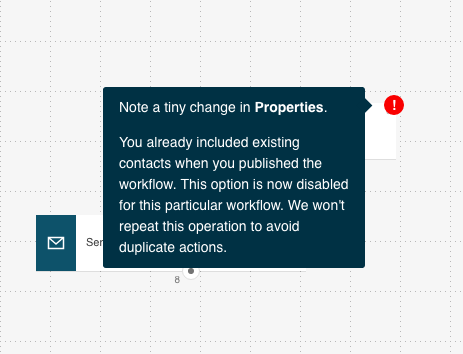 If you’d like it to accept contacts tagged before the workflow starts, switch on Include contacts that already have the tag when the workflow starts. For start elements only. 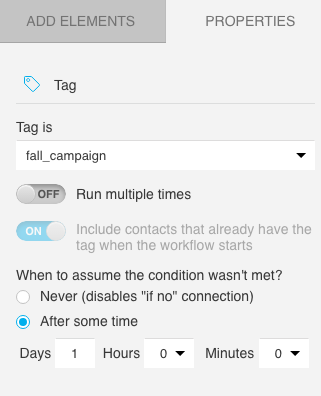 If tag accepts previously tagged contacts only at the beginning of your workflow. Only once for that element. For everyone tagged before the workflow starts, not just when it’s saved and published. If you’d like to know more about the difference between when the workflow is published (set to ON) and when it starts, see How do I define the time when my workflow starts and ends? Under Properties, select the tag. (Optional) Switch on Include contacts that already have the tag when the workflow starts. Be sure to do this for start elements only. Select the time setting for when to assume the condition hasn’t been met. For more information on how time settings work, go to How do I use time settings in condition properties. Why is the Include contacts option grayed out? Adding already tagged contacts is possible only once for a given element. So, you won’t be able to reset it after you publish your workflow. The switch is automatically disabled and grayed out. Note: This applies equally to workflows that you set to run immediately or schedule to run in the future. When you open a workflow that has started, you’ll find an exclamation point next to the If tag element. Note: The exclamation point only appears when you’re returning to the workflow for the first time. You should move the cursor over it to open a dialog box. The message tells you that the contacts tagged before the workflow started are now in that workflow. It also explains why the Include contacts option can’t be reset. How do I assign tags for the condition to work without the Include contacts option? Contacts can be tagged in another workflow. You can assign tags to them using Search Contacts. You can assign tags via API. For example, you’ve built two workflows. You’d like the second workflow to start adding your contacts as soon as they complete the first one. You can assign a tag to people who complete the first workflow. 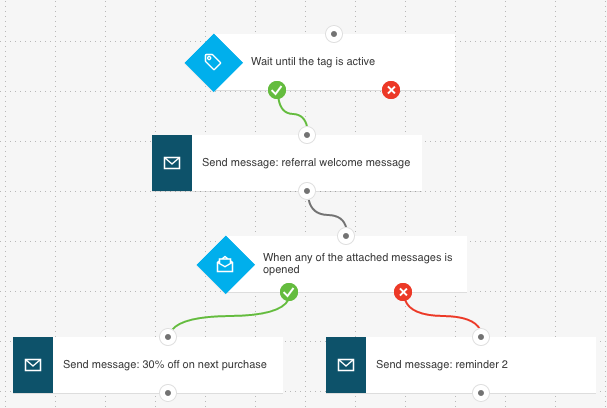 You can start the second workflow with the If tag condition. When you’re setting up the element, select the tag your contacts are assigned in the first workflow. Once they have the tag, they move onto the second workflow.